Trumpets have been around for ages, and they’re a staple of many different genres of music. Because of that, it’s no wonder that there are loads of them on the market right now – picking the right one for you might seem like a difficult task. Don’t worry though; you’ve come to the right place. If you just read this article, you’ll find out everything you need to know to buy the right trumpet for you. At the end, you’ll also find out which of the instruments reviewed here is the best trumpet available right now! There’s a lot that you have to consider when you’re buying a trumpet, too much to list right here. So, this section will tell you about the essential things, the ones that you have to keep on your mind at all times. So, Which Trumpet is the Best? This is the first thing you have to keep on your mind when you start thinking about buying a trumpet of your own. Buying a trumpet that doesn’t fit your skill level will leave you with a product you won’t love even if it’s actually good! Luckily, most trumpets are labeled as one of three types – beginner, intermediate or professional. Beginner trumpets, also called student trumpets, are made to be affordable and easy to play, providing a good starting point for someone who’s just learning the instrument. You don’t need to exert much effort to play one of these trumpets. However, they lack most advanced features and can be limiting for more skilled players. Intermediate trumpets are intended to be the next step in learning the trumpet after the beginner horns – or the starting point for people with experience playing other brass instruments. They have more advanced features, better construction, and a richer sound. Not quite as good as professional trumpets, but not as costly either. Professional trumpets feature the best construction and the richest sound as well as a ton of advanced features that lesser trumpet players won’t even think of using. The superb craftsmanship on display does cost a lot, but it is more than worth it for players that need their instruments to be impeccable. Decide on what you need by yourself, but don’t overestimate your skill or you might end up with a costly horn that’s useless to you. Before buying a trumpet, you need to check the construction of each part and see if it’s well-made and if it fits you. A badly made trumpet will have bad intonation and poor mechanics which will make it next to useless. One of the key pieces is the bell, the wide open part of the trumpet. In lower-quality trumpets it is made out of yellow brass, moving to red or rose brass for the better ones and the best ones feature a silver bell. The best bells are made out of one piece and are hand-hammered, allowing them to vibrate uniformly and produce the best sound. Lower quality bells are made out of two or more pieces that are welded together. The valves of the trumpet, looking like vertical tubes in the middle of it, are another crucial part. They can be made out of a wide variety of materials – nickel ones are the most durable, monel ones perform better but need more maintenance, while stainless steel ones arguably perform the best and are found in professional models. Make sure you find a trumpet with hand-lapped valves, which will ensure that they move smoothly, allowing you to play the trumpet quickly. The mouthpipe and the mouthpiece are important because they will be your main interface with the trumpet. It is usually made out of brass – red brass is more durable but less responsive while yellow brass produces a better sound but needs more cleaning. There’s more to this, but those are the basics that you need to know about. Not all trumpets sound the same, and they’re used for different purposes. A bright and cheerful sound is probably best suited to a jazz number, but if you want to play in a military band, you will need something with a darker, deeper sound. Test it out and make sure that you know what you’re aiming for before purchasing. Most trumpets are pitched in either Bb or C, and those two types have significantly different sounds. 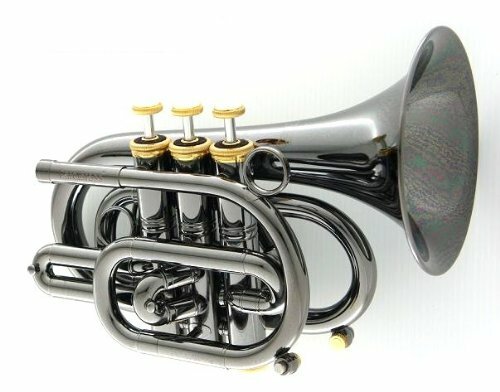 Bb trumpets are more popular and are far better for use in lighter pieces of pop, jazz or rock music due to their brighter sound. C trumpets have a slightly darker, heavier tone to them lending well to blues numbers and orchestral arrangements. Of course, you can use either trumpet for any type of music, but it might be more difficult to play a Bb trumpet in an orchestra due to most orchestral music being written for C trumpets. Trumpets pitched all the way to G also exist, though they are less common. However, if you need a deeper sound, you should get one of them. There are way too many brands out there right now, and you might find yourself perplexed. Here you’ll get a few short snippets about each brand and what their trumpets are like. Yamaha is a well-known music brand, and of course, they make trumpets as well. Their instruments are consistent and well-made, and they have made trumpets of all possible varieties. Jean Paul USA is a company that makes wide arrange of instruments, and their trumpets are quite versatile while being affordable. For beginners, this brand is one of the best choices around. Jupiter is a brand that’s almost synonymous with reliability. They offer sturdy instruments with good warranties and professional construction. If you’re looking for something that will last, this is where you need to look. 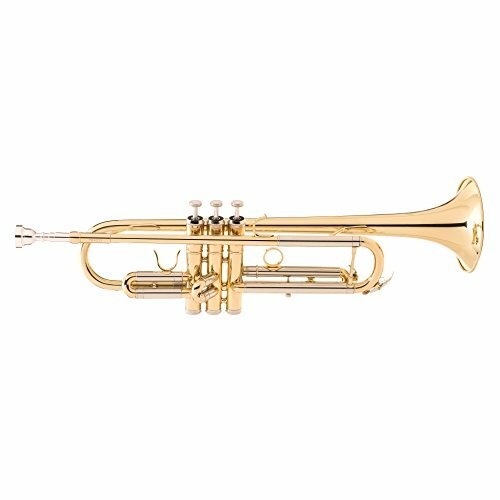 Allora trumpets are especially affordable, more so than most, but they also won’t last for a long time. They will play well while they last but you probably shouldn’t consider them unless you’re on a budget. Merano is a newer company that makes a lot of good instruments, trumpets included. Their selection is small but exceptional and it will just keep growing with time. All of their products are hand-crafted, giving them a unique feel. Carol Brass is a brand specializing in brass instruments, and most of their products are aimed at professional players. If you’re in the market for a professional trumpet, this is where you need to look. There are more of them, but too many to cover here. Once again, this brand delivers a quality-made beginner horn that doesn’t feel out of place in any music school. It is made to be comfortable and easy to play, and it delivers on that promise. The valves are made with obvious care, and they move as smooth as butter, making this trumpet a breeze to play. It’s also easy to tune, even for beginners, making it even more accessible. The whole trumpet is solidly constructed, and there are no obvious weak spots. The case it comes in is a different story – it’s badly made, and you will probably need to replace it. If you ever want to replace the trumpet or it comes with any defect, you can do so – the customer service and warranty are great here. The only other major downside is the cost – it is less affordable than some other beginner instruments, but it is worth the price. This is a beginner horn that can also be used as an intermediate one. It’s in between the two types and can function as either one, depending on how skilled you happen to be. It comes with everything you need to get started, including a case, a silver-plated 7c mouthpiece, playing gloves and cleaning gear. The construction on this trumpet is quite fine, featuring stainless steel pistons which perform incredibly well and allow you to play smoothly. The key inlays are made out of mother of pearl, and most of the body is made out of gold brass. Overall, it’s an incredibly fine instrument. Sadly, it does have a few issues – the mouthpiece doesn’t fit right, and the valves are not the greatest. Overall, it is a good instrument but not quite the best one out there. 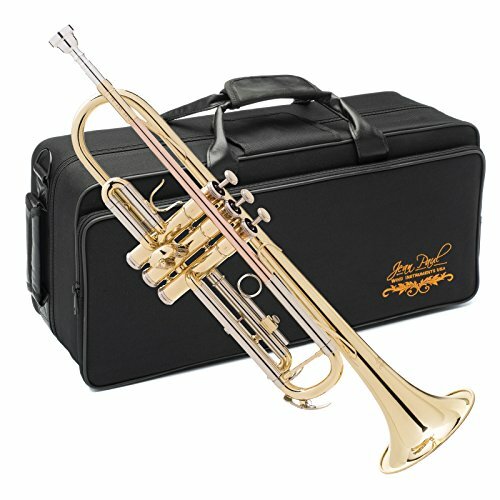 This is a great beginner horn made to fit almost anyone, and it is a great student instrument. It comes with a lot of extras to get you started – it has a good carrying case, a pair of fine playing gloves, a bottle of oil and a polishing cloth. 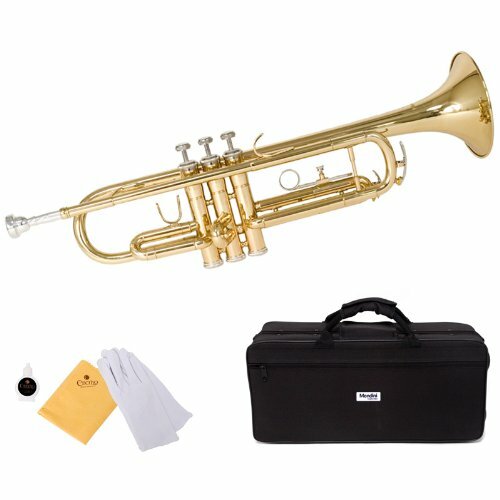 It comes at quite a great price considering everything you get and the trumpet itself is surprisingly well-made. It looks great, and it feels great to play. It’s made to be sturdy, and it won’t corrode easily. Even if something does happen, you’re covered by a 1-year warranty. The instrument is a bit difficult to tune by hand, and the valves might start sticking a bit after excessive playing, so watch out for that. Otherwise, it’s a great starter instrument especially if you don’t want to spend a lot of money. This is perhaps the ultimate starter instrument one can get. The price tag is incredibly high for a beginner trumpet, but the quality on display is also incredible. The construction is just amazing. The pistons are made out of stainless steel, like in a lot of professional trumpets, and it comes in either a lacquered brass or silver plate finish. It just looks gorgeous. It even has some advanced features like a 1st valve slide thumb saddle as well as a 3rd valve slide that can be adjusted at will. It comes in a beautiful wood frame case that’s durable and easy to carry. The sound is great and clear, no problems there either, but the question is – do you want to spend so much on a beginner trumpet? It is great, but the price is a bit much. You also don’t get a lot of accessories. As with most Yamaha instruments, this is a reliable horn that will serve you well even though it doesn’t stand out too much. It has a good look that makes its quality readily apparent at first glance. The sound it makes is great and rich, booming and cheerful. It is just a joy to play, and it plays incredibly smoothly even in the hands of complete beginners. If you’re having any problems getting good notes out of it, tuning it is a breeze even if you’re doing it by hand. For easier play, it also has an adjustable third valve trigger and a water key on the slide of the third valve. It is light, stable and easy to hold while playing – almost the perfect trumpet for a learner. Overall, it is a great starter instrument. The cost is high, but it delivers on the promise of quality that comes with the Yamaha name. 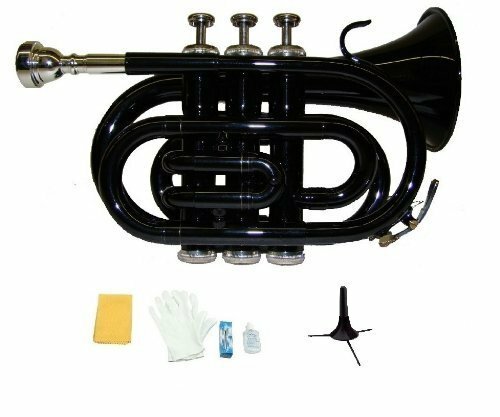 All of these five trumpets are great in their own way, but you know one has to be better than the other and today that’s the Jean Paul USA TR-430, simply due to the quality offered for the price. This horn costs less than most, and it is a great beginner instrument but can also be used by intermediate players. It doesn’t cost too much, and it has no major flaws. The construction is solid, and it looks beautiful while playing marvelously. If you do not agree, feel free to express yourself in the comments and, until next time, keep expressing yourself through music!